Kallaci String Quartet now has a new member on the violin, a position left vacant for two years following the unexpected death of violinist Kwun Hyuk-joo. Since Kwun’s passing, the group had been inviting guest violinists to perform with it. 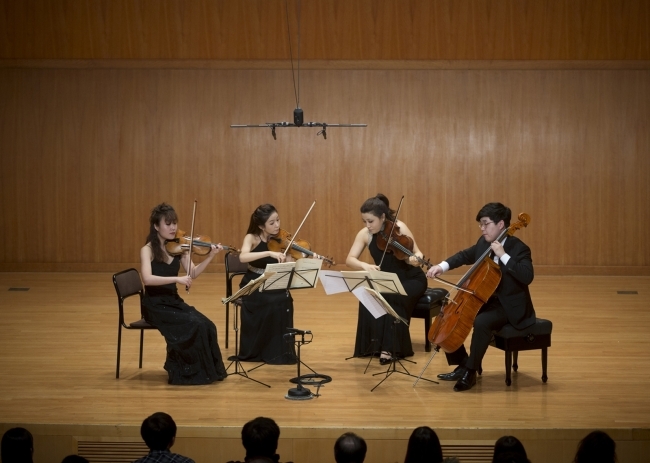 Now, with violinist Kang Su-yeon as a new member, the Kallaci String Quartet will hold a concert at Kumho Art Hall on Aug. 30. Kang, a 29-year-old Korean-Australian, has performed as a soloist and a chamber ensemble member, mainly in Europe. In 2015, she won the first prize and the audience prize at the Michael Hill International Violin Competition. Kang first performed with the Kallaci String Quartet last December as a guest violinist in a concert series titled “The Years of Beethoven ’17’20” at Kumho Art Hall. The four members will again perform Beethoven’s quartet pieces for the upcoming concert, marking the group‘s fourth Beethoven concert. The quartet will perform a total of four string pieces by Beethoven, including the composer’s masterpiece String Quartet No.14 in C-sharp minor, Op.131. Formed in 2012, the other three members are violinist Jang Yoo-jin, violist Lee Han-na and cellist Shim Joon-ho.